Our technitian have tested this fridge and it is working perfectly. Only small dents on the sides. Normal signs of “wear and tear” in the interior parts of the fridge. 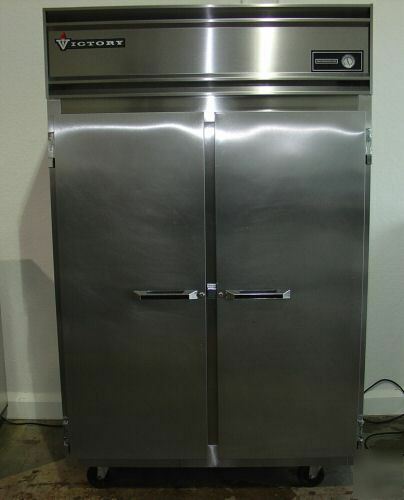 It comes with casters (wheels), making this fridge very easy to move. The cabinet front and doors are constructed of heavy gauge polished stainless steel to maintain an attractive appearance for years. The self-closing doors are securely mounted on rugged cam-lift hinges. We do not have keys available for the cylinder locks on the doors. Interior lighting is controlled automatically by a switch mounted on the hinge. The heavy-duty wire shelves are adjustable in one inch increments. A wide door opening allows the use of a variety of optional pan slide types. 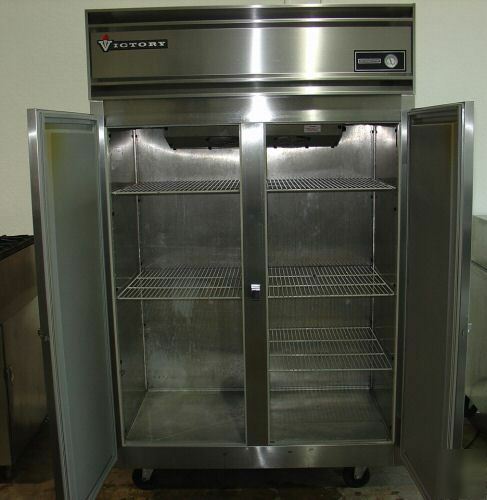 All components of the self-contained refrigeration system are mounted on top of the cabinet. The air circulating fans and the forced convection cooling coil are contained in an insulated housing separate from the product zone allowing for maximum food storage capacity. All condensate water is disposed of automatically by the energy efficient non-electric condensate evaporator, no plumbing is required. - Address with zip code information. - Is a commercial or residential address? - Do you have a mechanical mean to unload the unit like a forklift or a loading dock? - Do the driver of the truck needs to deliver the unit inside the location or house?